Hi everyone and a happy weekend to all of you! Sorry for being late with the post. My entry is a reach-pink begonia for today. Today's favorite picture is a beautiful carnation flower from hapsydeco. I have only five pictures till now and it would be necessary at least 15, for a short 1.20 min slideshow. Those willing to participate, please send your photo url to my or some info about it to my contact form or email. I can't showcase on photos that I have no written for, from the author. The photos have to be at least 640x480px, 4:3 (landscape) format. I have to be ready with the movie for next week, so I'm waiting for the photos till Monday included. Fine colors in Your picture. Beautiful colors and just simply gorgeous flowers. Wonderful shots. We must have had pink begonia's on the mind.. my post has them too! Love your pictures! beautiful begonia. Love the colours. The begonia is perfect, and so is the lighting! Maia, do you mean "portrait" for the photos you want submitted? That means vertical. Most of the photos are "landscape," or horizontal, and all the ones I sent were. Shall I choose different ones? Yes Sara you are right, not portrait but landscape. Thanks for the correction, I was late posting and wrote in a hurry. Beautiful color and lovely, healthy petals. 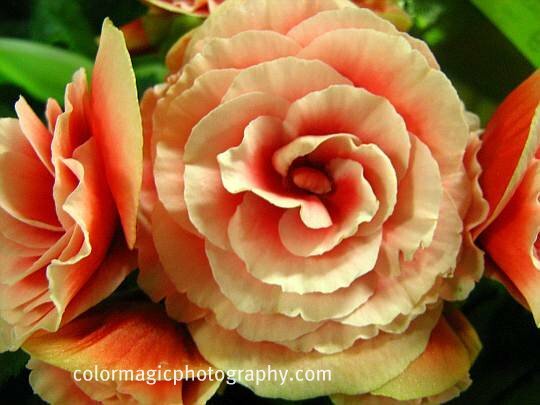 What a beautiful color, I love begonias. You can adjust the size to landscape if you crop the photos I guess. I also got the voting notice late and when I looked in my spam box, another voting reminder was there! So sorry! Very pretty. Actually, they remind me of the Thai carving on watermelons. The begonia looks like a lovely rose. So beautiful! Thank you very much for hosting Macro Flowers Saturday. Mussaenda philippica ‘Aurorae’ this is the name of my white flower. I check up with a Singapore plant book and then went on ggogle. Que lindas begônias! Visto assim de tão pertinho dá a impressão que podemos tocá-las!